HUNTINGTON, W.Va. (CN) – As President Donald Trump prepares to declare the opioid crisis a national emergency, the director of a residential treatment facility in West Virginia hopes the renewed federal focus on the epidemic will help her save more of addiction’s littlest victims. Rhonda Edmunds is the director of nursing at Lilly’s Place, a treatment facility in Huntington, West Virginia, that cares for infants suffering from neonatal abstinence syndrome, the name for a group of problems experienced by a newborn who was exposed to addictive opiate drugs while in the mother’s womb. The facility is currently providing care to four infants, and has room for up to 12 at any given time. But Edmunds says there is so much more that needs to be done in communities like hers in southern West Virginia, which has seen an explosion in opioid deaths and addiction cases. Besides making a declaration from the White House, Edmunds would like to see the president commit significant federal dollars to dealing with the growing crisis. And she has reason to be hopeful. Just last week first lady Melania Trump and presidential counselor Kellyanne Conway visited Lily’s Place to get a first-hand look at the problem and what Edmunds and her staff are doing to try to address it. The scope of the crisis is staggering. In July, a White House commission convened by Trump and led by New Jersey Gov. Chris Christie issued a report that said every day at least 142 deaths occur in America that can be directly attributed to opioid abuse. Edmunds said that in 2015, the last year for which there are reliable numbers, 92 out of every 1,000 babies born in West Virginia had severe enough withdrawal symptoms to require treatment, and 150 out of every 1,000 babies born had addiction systems evident enough to be noted by medical professionals. Under West Virginia law, if an infant tests positive for the presence of drugs, it is assigned a case worker from the state’s Child Protective Services. The case worker determines the appropriate treatment for the child and makes decisions related to where they will go once discharged. The staff at Lilly’s Place has no say in where the child is placed. That is left up to state authorities, Edmunds said. The infants who make their way to Lily’s Place are suffering from the mental and physical pain of withdrawal, are highly sensitive to light and noise, and easily become over-stimulated. Within the facility, quiet and calm dominate. The lights are kept low, and the staff employs a range of comforting techniques to ease the infants’ discomfort. Edmunds, a former staffer with the neonatal therapeutic unit at nearby Cabell Huntington Hospital, said infants suffering from addiction and withdrawal-related issues typically stay at Lilly’s Place for a period of three to six weeks. 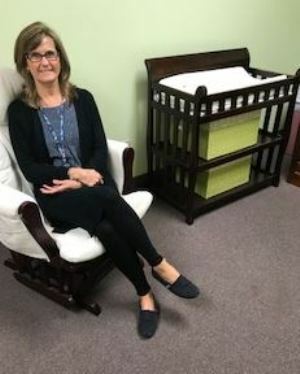 She said the facility’s approach to dealing with addiction in infants is based on experience, and on a visit she and another Lilly’s Place co-founder, Sara Murray, made to a facility in Kent, Washington, that had been caring for infants with NAS for twenty years. “We saw the difference the environment made for these babies, we went out and toured their facility, and decided we wanted to do something like that in West Virginia,” Edmunds said of the trip. It is the nature of substance abuse in West Virginia that people who are using are typically abusing more than one drug. This makes recovery harder for the infants, and leads to longer rather than shorter stays. Methadone is used to wean the infants off illicit drugs, and make them comfortable until their withdrawal symptoms subside. More than 50 percent of the infants that spend time at Lilly’s Place are sent home with their parents. About 45 percent are sent home with another family or are placed in foster care. Edmunds says the lives of graduates of Lilly’s Place are followed closely by the facility. “Typically, what we see are babies with increased muscle tone, where they had that as part of the withdrawal process, and sometimes they’ll need some special exercises to help them work through that,” she said. “We are also hearing that when some of these babies get to preschool they require some redirecting, but we want to be proactive and get some things in place to help these babies because we don’t ever want them to be labeled as ‘bad children’ simply because they have a tendency to be over-stimulated.,” Edmunds said, adding that often times, the children only need a place to step back and regroup before joining their classmates again. But the care doesn’t end with the infants. Edmunds says a large part of providing ongoing care to the patients of Lilly’s Place in helping the parents in their own recovery and in creating a healthy home environment for their babies. Edmunds said from the beginning, Lilly’s Place has benefited from the selflessness of its nursing staff and volunteers. She said while all of the nurses could be making more elsewhere, they were drawn to and continue to stay at Lilly’s Place because they feel the care they are giving is a calling rather than a profession. Another thing Lilly’s Place has enjoyed since it opened its doors in 2014 is the support of the community. Edmunds said there is never a shortage of volunteers, and that the facility’s storage room is packed, floor to ceiling with donated diapers, wipes, and other supplies and baby essentials. Looking toward the future, Edmunds said she hopes to soon be able to expand the facility and make room for up to 16 infants at a time. And against the changing background of healthcare in America, she hopes that enhanced federal attention to the opioid crisis will enable Lilly’s Place to add a full-time counselor to work with parents, helping them during their own recovery and making them more effective at dealing with the early challenges of childhood.